Whilst taking tactical breaks from my dissertation work, I came across a snapchat I sent, roughly a year ago, while I was studying in the University of Eastern Finland, as part of my Erasmus exchange at the University of Leicester. 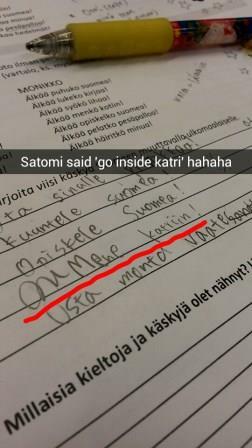 I was enrolled on a Finnish course whilst studying in Finland, and my friend (Satomi) accidentally wrote ‘go inside Katri’ rather than ‘go to Katri’. It revolved around the confusing uses of ‘cases’ in the language which causes a change in context by changing just a few letters. In this case, me and Satomi could never have known that she was wrong, because we had been taught that ‘Mene Katrissa’ would literally translate into ‘go into Katri’. But, why ‘Katriin’ would have the same meaning, we did not understand.. I’m just glad Satomi wrote that down rather than me, hahaha. Obviously, I felt the need to send this to all of my friends instead of paying attention to the lesson. Chris has now graduated from the University of Leicester. I'm a guy finishing my Undergraduate degree in Biological Sciences (with a year abroad) at the University of Leicester. After a fun year in Finland, I will be getting down to the nitty gritty of life for a final year in Biology (specifically Microbiology). Along with a rant on studying, there will be a sprinkling of society chatter and my imminent thoughts on growing up into graduation and the beyond!